Straightforward and simple, our standard Pink Linen Personal Checks are for easy to please customers like you! 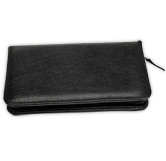 The crisp color creates a clean and classic look for your personal checkbook. Linen Pattern Personal Checks are also available in gold, blue and purple. Get your Pink Linen Personal Checks today!